Top seed Wang Hao took a huge step towards becoming the 2015 Thai Open Champion by beating Germany’s Jan Gustafsson in the penultimate round of Thailand’s biggest and richest tournament at the Dusit Thani Hotel Pattaya on Saturday. With 380,000 Baht of prizes on the line on the final day, nothing is certain, but the Chinese top seed has become the first outright leader of the tournament, with a score of 7/8, at the right end of the event. 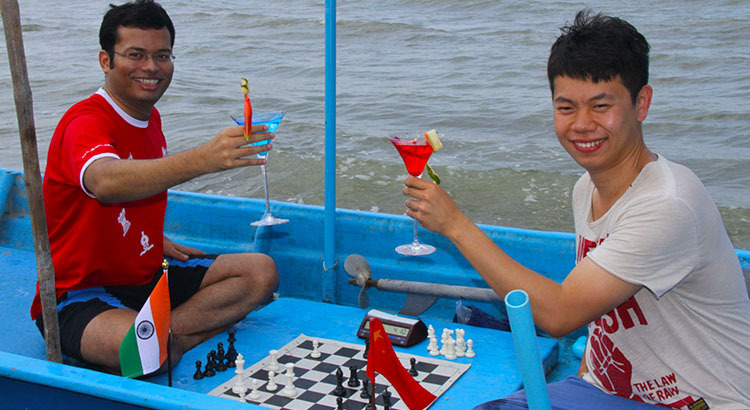 Wang’s victory over Gustafsson came after 60 moves and almost five hours play, with Wang Hao using an original Duke of York strategy with his king to win the endgame. Five players sit half a point behind Wang, including the man who could pose the biggest threat to Wang, ex-world title challenger Nigel Short. The Englishman ended Jozsef Horvath’s unbeaten run in the tournament with a long-term pawn sacrifice resulting eventually in a winning attack. 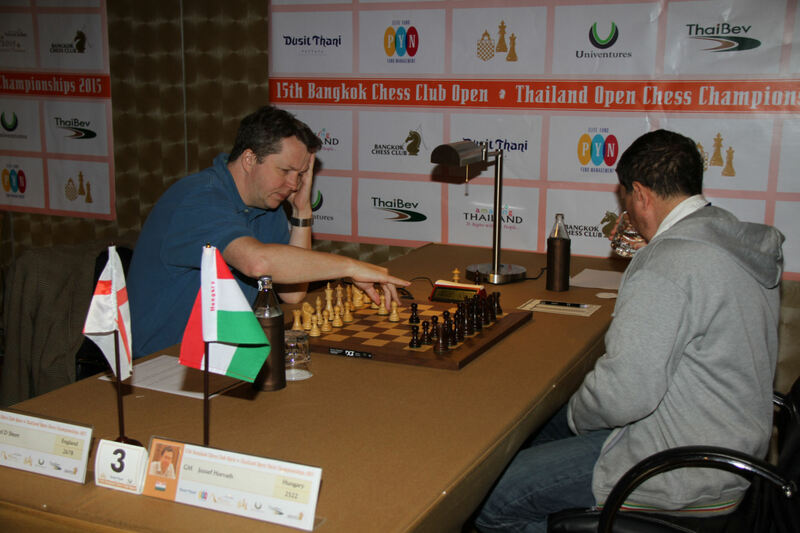 Other players to reach six and a half points were second seed Paco Vallejo, who ended Australian Max Illingworth’s hopes for earning a Grandmaster title in Pattaya, plus India’s Surya Ganguly, who fought back to defeat compatriot Deepan Chakkravarthy. Poland’s Kamil Dragun won a long endgame against Dane Allan Rasmussen, and Diptayan Ghosh provided another Indian success – and moved the Indian International Master closer to his Grandmaster title – with an upset win over Bartosz Socko. 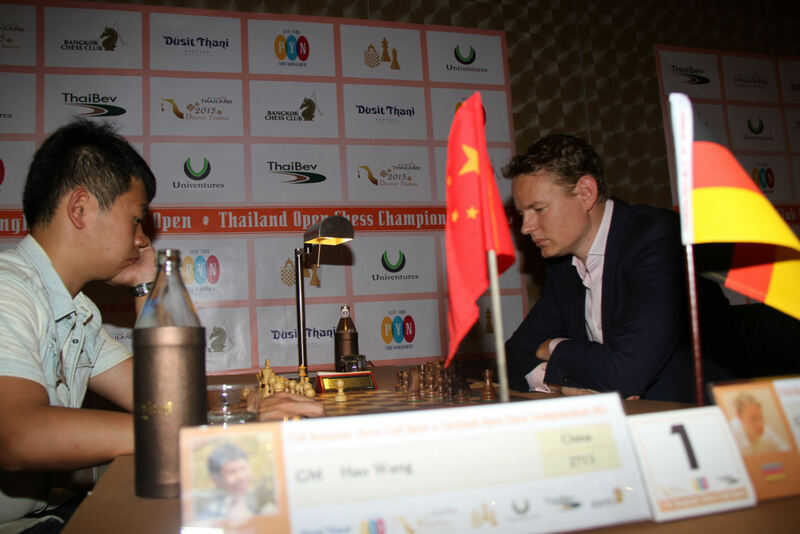 Thai hopes for a podium finish ended on Saturday when Boonsueb Saeheng was held to a draw by Pattaya’s resident Grandmaster Gerhard Schebler of Germany. 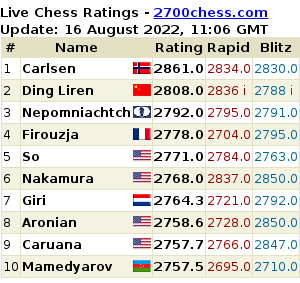 Saeheng retains hopes for a top ten finish, remarkable for a player seeded 69th at the start of the tournament. The final round of the Thai Open, begins at 9am on Sunday at the Dusit Thani ballroom. Spectators are welcome and admission is free.